The Carlisle Day Tripper Kayak Paddle, with its fiberglass reinforced polypropylene blades and oval indexed aluminum shaft, make it a fantastic deal at under $50! 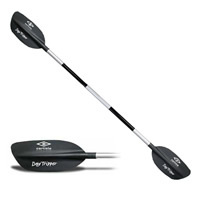 Just because it's cheap don't think the Day Tripper is a throw away paddle. We've sold thousands of Carlisle Day Trippers over the years to thousands of happy kayakers - and nary a complaint. Blade Length & Width: 16" x 7"